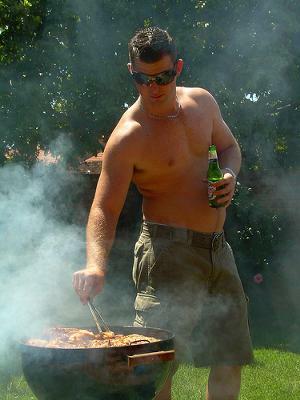 FATHER'S DAY FUN AND BRAAI!! -Staff answering all questions you may have regarding our business while promoting our guest house and all variety of spa packages and extra services offered on the premises. -spa therapists standing by to offer you high quality corporate massages including foot,hand,back,neck and head massages while you are enjoying a beautiful scenery and view and a thirst quenching beverage or delicious mouth watering red meat bites with accompanying side dishes and salads for lunch! -Suprising and fun activities for the men! Children under 12 years: R 90 p.p! 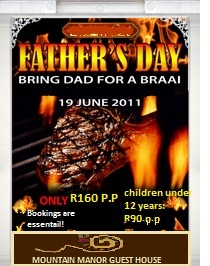 All THIS WILL TAKE PLACE ON FATHER'S DAY 19 JUNE 2011...FROM 11:00 a.m to 17:00 p.m! 98 Cole Road lynnwood Shere Pretoria.